What is the Process for Dental Implants in Palm Beach Gardens? As you age, tooth loss becomes far more common. In fact, about 120 million people in the U.S. are missing at least one tooth. About 36 million Americans have no teeth at all. For this reason, more and more people are turning to tooth replacement to prevent teeth from shifting, make eating easier, and rebuild their smile. Since dental implants in Palm Beach Gardens have become increasingly popular, your dentist is laying out the process from start to finish so patients know what to expect. After determining your eligibility, your dentist will take X-rays of your mouth and discuss your various implant options. After the consultation, you’ll get a surgery date scheduled and come back to have the implant placed. Before surgery, you’ll be given a local anesthetic to make you as comfortable as possible. Typically, patients experience less discomfort than expected and can continue working the next day, but this will vary from patient to patient. Common side effects after dental surgery include minor swelling, bruising, bleeding, and pain that’s easily managed with over-the-counter medications. After surgery, the process of osseointegration and healing will take anywhere from three to six months to complete. This allows the implant to fuse with your existing bone and your gums to heal around the implant. During this period, it’s crucial that you practice daily oral care and avoid using tobacco products of any kind. You’ll also want to keep a diet made up of soft foods. Once the integration is complete, you’ll have a small connector placed, known as an abutment. This attachment is placed directly to the implant just above the gumline. Since this requires an incision into the gumline, a few more weeks of healing will be needed before the restoration is placed. 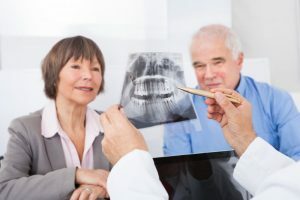 Once the gums heal, your implant dentist in Palm Beach Gardens will take impressions of your remaining teeth to make your custom implant crown. This crown connects to the abutment and acts as your new tooth. Implant crowns can’t develop decay since they’re made of porcelain, however that doesn’t mean you should forgo daily oral care. To prevent complications, brush your teeth and implant twice a day with a fluoridated toothpaste and floss daily. Pay close attention to the area around the implant to keep the gums healthy. Have more questions about your implant process? Schedule a consultation with your dentist today! Dr. Greg Riley guides patients through every step of the implantation and restoration process. By keeping the process in-house, he can place dental implants quicker and more efficiently. To learn more about dental implants in Palm Beach Gardens, contact him through his website. Comments Off on What is the Process for Dental Implants in Palm Beach Gardens?